Hearing disorders affect more people than you might think. In fact, one in six people in the UK experience some form of hearing loss. Age is a big factor, with more than 70% of over-70s and 40% of over-50s experiencing some hearing loss. Despite these numbers, it takes an average of eight to ten years for sufferers to take action with their hearing loss. So if you do notice any hearing problems, the key is to catch it early. From outer ear pain (otalgia) to middle-ear pathologies like bacterial infection (otitis media) or calcification of the middle-ear bones (otosclerosis), problems come in all shapes and sizes. They often require a visit to your GP, but many ear problems can also be dealt with by a professional audiologist. Here are three common ear problems your Leightons audiologist can help treat. Earwax keeps your ears clean and protects against germs but sometimes too much earwax can build up inside your ear, causing hearing loss, earache, itchiness, tinnitus (more on this below), and even affecting your balance. Luckily, excess earwax is often easily removed. Your local branch of Leightons offers a variety of earwax removal techniques, including water irrigation and microsuction. For more information and to book an appointment, call us on 0800 40 20 20 or visit your nearest branch. Far from a condition that only affects rock stars like Neil Young, Liam Gallagher and Eric Clapton, tinnitus is widespread: it’s estimated to affect 10% of the UK population. Tinnitus is defined as any noise within the head or ears, without the presence of an external sound source. It is most commonly described by sufferers as a ringing, whistling, hissing or rushing sound – but it can take any form. Some people hear sounds similar to music, while others hear noises that beat in time with their pulse. The cause of tinnitus isn’t completely understood, but has been linked to exposure to loud noise, earwax build-up, stress, age-related hearing loss, and other ear conditions. Although there is no miracle cure for tinnitus, there are ways to manage it and make it easier to live with. 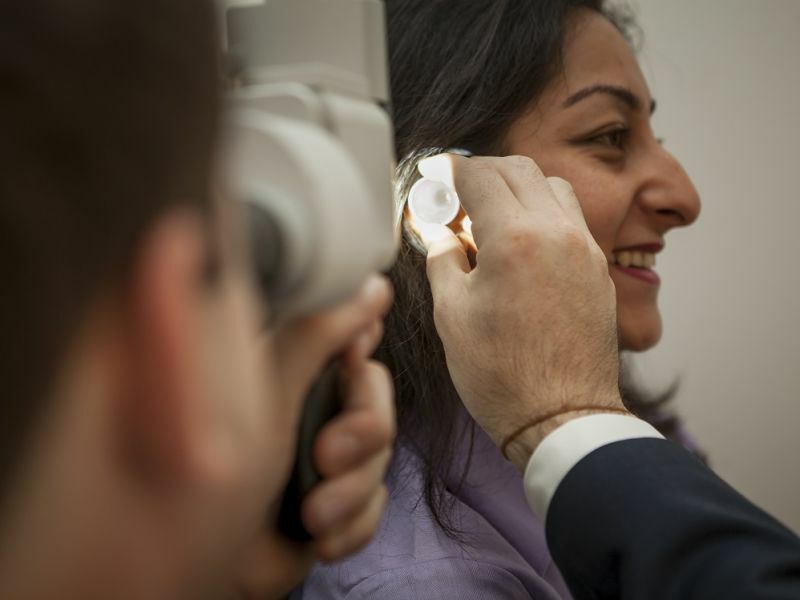 Leightons’ expert audiologists offer a free tinnitus consultation service, helping you build the best treatment plan to deal with this often-distressing condition. Speak to our friendly staff to get the support you need today. Sensorineural hearing loss is one of the most common causes of hearing problems. It occurs when the tiny hair cells inside your ear are damaged, causing permanent hearing loss. It affects your ability to hear quiet sounds and reduces the overall sensitivity of your hearing. The most common type of sensorineural hearing loss is age-related, also called presbycusis. It occurs naturally as part of the ageing process, and often worsens with age. It’s becoming more common, mainly because we are all living longer. However, advances in technology mean today’s hearing aids – like the tiny Oticon Opn® – are effective, reliable and unobtrusive. Contact your local Leightons branch for a free hearing aid demonstration on any of the latest digital hearing aids. All of our expert hearing aid dispensers are registered with the HCPC (Health & Care Professions Council) and are members of the British Society of Hearing Aid Audiologists. Book an appointment online or call us on 0800 40 20 20.